Southern sophomore Kaitlyn DeLacruz drives a ball during the Lady Tornadoes 9-4 victory over Trimble on Friday in Racine, Ohio. 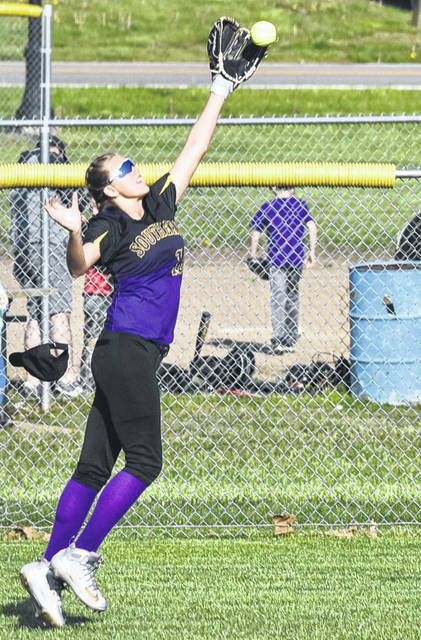 Southern senior Shelbi Dailey attempts a leaping catch during the Lady Tornadoes 9-4 victory over Trimble in a Tri-Valley Conference Hocking Division contest on Friday in Racine, Ohio. RACINE, Ohio — The hits just kept coming. 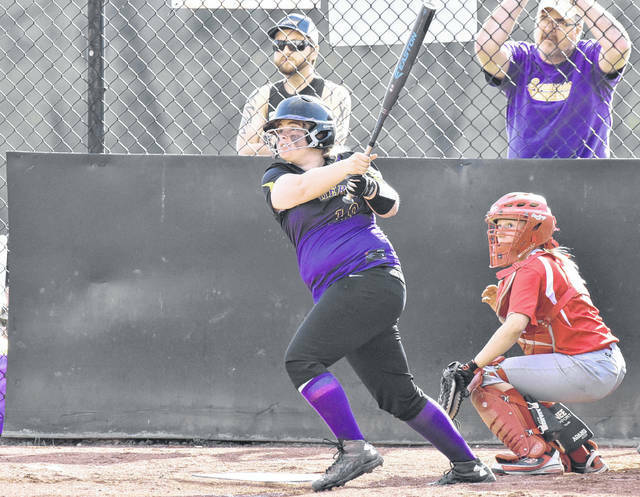 The Southern softball team produced mightily at the plate Friday night at Star Mill Park, as the Lady Tornadoes had 17 total hits en route to a 9-4 victory over Tri-Valley Conference Hocking Division foe Trimble. SHS (11-3, 10-1 TVC Hocking) took a 5-0 lead in the bottom of the first — highlighted by a Kaitlyn DeLacruz home run — as it sent 8 batters to the dish in the inning and collected five runs on six hits and one Lady Tomcats error. Trimble cut the deficit to 5-1 in the top of the third, as Macinsey Cooper led off the inning with a single and later scored on a two-out error on a ball off of the bat of Skylar Moore. The Purple and Gold tacked on two additional runs in the fifth, as Paige VanMeter and Lauren Lavender started the inning with back-to-back singles and later scored to extend Southern’s lead to 7-1. The Lady Tornadoes further their advantage in the sixth, VanMeter singled and scored on a double by Lavender to push the lead to 8-1. Lavender added Southern’s second run of the inning when she scored on a double by Shelbi Dailey , as the Purple and Gold carried a 9-1 advantage into the finale. The Lady Tomcats narrowed the margin in the top of the seventh, as Gracie Hankinson reached on an error to start the inning and later scored on a single by Rhiannon Brown. Brown reached home when Moore drove a two-out two-run home run beyond the left field wall to cut the deficit to 9-4. Southern prevented any further attempts of a Trimble rally, as Sydney Cleland retired Lackey by way of a strikeout to close out the five run victory. The win also served as a season sweep of THS for Southern, having previously earned a 15-2 victory over the Lady Tomcats on April 9 in Glouster, Ohio. Cleland earned the pitching victory for the Lady Tornadoes, as she surrendered four runs on five hits, with one walk and two strikeouts in seven innings of work. VanMeter, Lavender, and Jaiden Roberts led the way for SHS in the hit category, as each finished with three safeties. Roberts also scored once, while Lavender scored three runs and had one RBI in the contest. DeLaCruz was next with two hits, including a home run, scoring once and driving in a pair of RBI. Baylee Grueser followed with two hits and had one RBI. Dailey and Josie Cundiff each provided one hit apiece, respectively, to conclude the hit totals for Southern. Kayla Boyer and Jordan Hardwick scored two runs and one run each. The Lady Tornadoes committed three fielding errors in the contest, while Trimble had five miscues. Southern stranded a total of six runners on base, as the Lady Tomcats left eight on the base path. The game served as Senior Night for as SHS recognized Roberts, VanMeter, Cundiff, Dailey, Lavender, Cleland and Jolisha Ervin. Following the game, Southern head coach Alan Crisp discussed those players impact on his ball club and dedication to the sport. Crisp also elaborated on his team’s remaining scheduled and its magnitude regarding their place in the conference standings. Southern hosted Tri-Valley Conference Hocking Division foe Wahama in a doubleheader on Saturday. The Lady Tornadoes are scheduled to travel to Waterford on Monday followed by Belpre on Wednesday, before returning to Star Mill Park on Friday to host Eastern.